This week I joined the Fulham Women’s Institute to talk about romantic fiction over the last 50 years. Predictably, a combination of lively questions and a (slight, very slight) tendency to beady-eyed obsessiveness on my part, bounced me off course into general appreciative splurge. So I never told them, as I had meant to, about one of my heroines. I had a great time, but I’m afraid I short-changed them. This is an apology and an attempt to supply the deficiency of my talk. She was published in 11 languages. Her career spanned forty years. For the first ten years of Public Lending Right in the UK she was in the top 50 authors borrowed from Public Libraries. She wrote 35 novels and an autobiography, No Time for Romance, which is an unforgettable account of wartime from the point of view of one of the ordinary people whose lives were utterly transformed by it. She was left the sole breadwinner by her husband’s illness very soon after marriage, when her only child was five months old. For the rest of her life she earned her living from writing. The books and short stories ensured that her daughter had a stable, loving and stimulating home – and the sort of education that Lucilla had not had herself. Veronica went to Cambridge, read history and became communications adviser to the Labour Party among others– a towering presence, according to her obituary in The Guardian. Veronica died in 2002. It must have been dreadful. 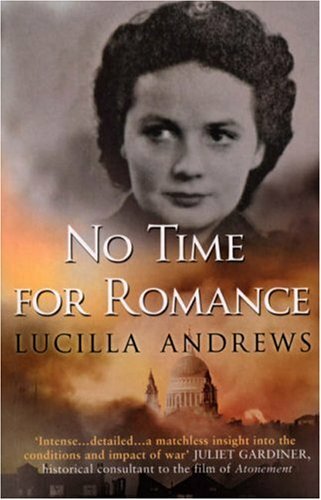 But when I saw her in Edinburgh, on the occasion of that Lifetime Award, Lucilla Andrews talked about Veronica’s achievements and the fun they had together, not the loss. She made it clear, too, that she, personally, was passionate but never doctrinaire about women’s rights. She had a right to be. She had, after all, paid her dues. Her writing also made not inconsiderable amounts of money for publishers and agents, at various times. This, you would say, was a woman of energy and intelligence, of vision and some moral force. Was she listened to with respect? In 1955 she suggested to her publisher that it would be timely to make a television series based on her imaginary hospital St. Martha’s. A hospital was, she argued, a microcosm of society; it was full of drama as well as “humour, absurdites, incompatible temperaments and love affairs”. Her books were successful. Her writing skills were proven. Above all, her knowledge of the background was unrivalled. (She did not say this, you understand. She may have thought it was self evident, as it certainly should have been.) As she later said in her autobiography, she drew on her nursing experience “without falsification”. Her former colleagues on the Nursing Times, said that her novels were “faultless in their settings … stoical, spirited, humane.” Doesn’t sound trivial, does it? Television needed drama. The time was surely right. So what happened, when she suggested her hospital series? Flat rejection. Specifically, “Oh no dear, that may do for women’s magazines but it won’t do for television.” Men, you see, watched television. They would not be interested in little stories for women. And then came . . . Dr Kildare; Emergency Ward Ten; Angels; blah, blah, blah … right up to our own day of Casualty; Grey’s Anatomy, Green Wing and dozens of others. Nope. Even though, according to a Harrap’s representative from the old days who made it to the Memorial Service, the office was waiting for her ms to arrive so that they could whisk it off to printing, with minimal editorial, to get it out there and earning. But they never thought she was worth listening to. It makes me so angry. And these days she is largely forgotten, which is a waste. Her accounts of wartime, whether fictional or memoir, are electrifying. If you want to know what it was like to be a nurse in St Thomas’s during the Blitz, read Frontline 1940. The hero, an American journalist, has been present during the fall of Paris and he expects London to fall too. This is what it was like to expect to be defeated and hope to hang on for just one more day. Please read it, Fulham WI and World. It’s worth it.